Perpetual license does not expire, but only valid for the current version you're buying. Purchase for one-time fee, lifetime free upgrade to every newest version. For family or office with multiple computers. Save big and enjoy upgrade protection. Buy Now Need to backup more PCs or server? AOMEI Backupper Pro comes with more convenient, flexible and comprehensive backup & disaster recovery solutions to keep your data safe so that you can enjoy peace of mind. 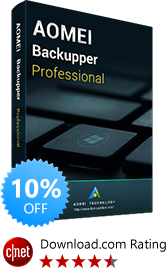 Easy and reliable FREE backup software trusted by over 20,000,000 users. 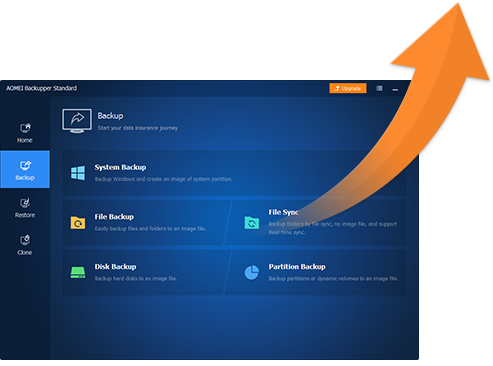 Restore a backup image to another computer with dissimilar hardware, or move OS from physical to virtual machine (P2V) by backup and restoration. Perform backup, restore, and clone operations from the command prompt. Synchronize newly added or modified files from source to target path as soon as the change has occurred. Manually extend or shrink partitions on the destination disk during clone or restore. Merge full backup and its chained incremental backups into a single backup. Automatically run backup tasks based on system shutdown/startup, user logins/logoffs, and USB plugged in. Exclude certain file extensions from folder backup or sync. Send the backup results to you through email and SMS messages. Divide a large backup image into multiple smaller files with specific size. Start unlimited client-side computers within LAN through network booting for system maintenance. Need Backup Solutions For Your Company or Business? No matter system administrators who manage physical & virtual servers, enterprises who have large number of computers required to protect, or service providers who want to create a reoccurring revenue by offering backup and disaster recovery as a service to their customers. AOMEI Backupper can meet all different needs.